Throughout the Greater Las Vegas, NV and Stemple Pass, MT area, Clark the Carver of Carve Me A Bear! 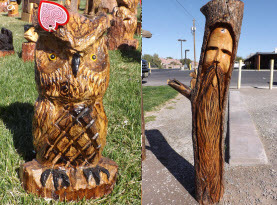 Chainsaw Carvings has been gifting the locals with his talent and passion, carving wood with a chainsaw. For over 30 years he has applied his craft and created many wonders. During the hot summer months he enchants Montana with his work of art. 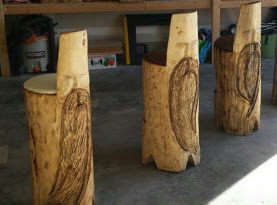 From totems, to animals, to furniture, Clark the Carver turns hunks of wood and even old stumps in your yard, into masterpieces. Among the many animals he designs, bears are his specialty. With the use of both soft and hardwood variations, we utilize pine, redwood, cottonwood, and ponderosa to carve out a plethora of one of kind bear carvings with the use of a chainsaw. Carve Me A Bear! 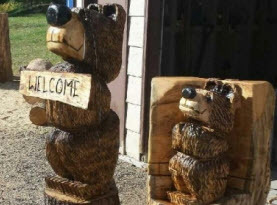 Chainsaw Carvings offers a wide range of bear carvings that you might feel partial to, or we can even custom make your bear design carving. With so many options, an adorable or fearsome bear chainsaw carving could be adorning your home or landscape with in the Las Vegas Valley. Bears have often been spotted on Clark’s totems. Totems are frequently associated with many Native American Tribes, and though they range in specifics, many of the tribes share many of the same characteristics and attributes associated with the bear. It is said that the bear symbolizes strength and wisdom, and are often identified as healers and with medicine. Where the healing comes into play is because bears were frequently spotted fighting, and it was presumed they manifested healing powers to live on after great battles. The Brown bears, including Grizzlies are believed to have a powerful life source, and are known for their temper and nasty disposition. The Black Bears are not only practical and powerful, but are wise and discerning. They are less aggressive in comparison to the Brown Bear. Polar Bears are considered the most powerful, but also the most stubborn, determined, and tenacious. With the many bears of the world out there, finding a bear that speaks to you is simple. There is much to be said about the bear, many cultures have their own view points. Some have symbolism and signs of the bears, where others give their awesome power respect. Some people just find their mannerisms adorable and enjoy collecting bear figurines, sculptures, and anything bear. With Carve Me A Bear! Chainsaw Carvings, the locals in Las Vegas, NV and Stemple Pass, Montana and anywhere in the United States and the world can obtain a unique chainsaw carved bear for a loved one with the bear obsession or perhaps you want to treat yourself. No matter what your motives are, Carve Me A Bear! 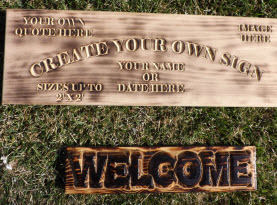 Chainsaw Carvings has just what you are looking for. Contact us today to browse through our inventory or create a custom order!